This week our blog is written by one of our Environment Hall Rep’s from Albany Park Hall, Fiona Blackwood! Fiona has worked hard at Albany Park Hall this past academic year and we are very thankful for her continued efforts and enthusiasm to make the university a more sustainable place and increase awareness within her hall of all that is going on on our campus. Take a read to see what she has been up to this past year, and if you would like to learn more about the role of Environment Hall Rep please email environment@st-andrews.ac.uk! First of all, my name is Fiona, and I’m coming to the end of a year as the Environments Rep for Albany Park. It’s been a challenging but fun role that has helped me to become more aware not only of some of the difficulties in promoting sustainability within halls, but also some of the fantastic things going on around St Andrews around sustainability and the environment. Halls are the first time away from home for many students, and especially in self-catered halls such as Albany where food is a more prominent issue, it can provide a really great opportunity to encourage environmentally-conscious habits. On top of that, having such a diversity of students in the university as a whole can enable amazing discussions around sustainability, and halls are a great venue for this. However, it’s so easy to feel overwhelmed with deadlines, exams, maintaining a social life, and the pressure to become somewhat employable that it can often become hard to act in a more environmentally conscious way. Personally, I think the two main perceived barriers to this are time and cost. In terms of time, having hall environments reps makes it easier to try and improve things like recycling and encouraging cycling by hopefully providing another liaison between the students, residential services and various other groups within St Andrews such as Bike Pool. And then there’s the cost element, which can be discouraging when money is tight and it can seem difficult to find sustainable food and household products at an affordable price. However, The Tree is a fantastic project run by Transition which aims to make it easier and more affordable to buy local, Fairtrade and organic produce, and this year we set up a new drop-off point in Albany, which has hopefully made residents more aware of the initiative and encouraged its use. And from affordable food to completely free, Albany is also lucky enough to boast its own Edible Campus garden, where several events have been held, making residents more aware of the space. 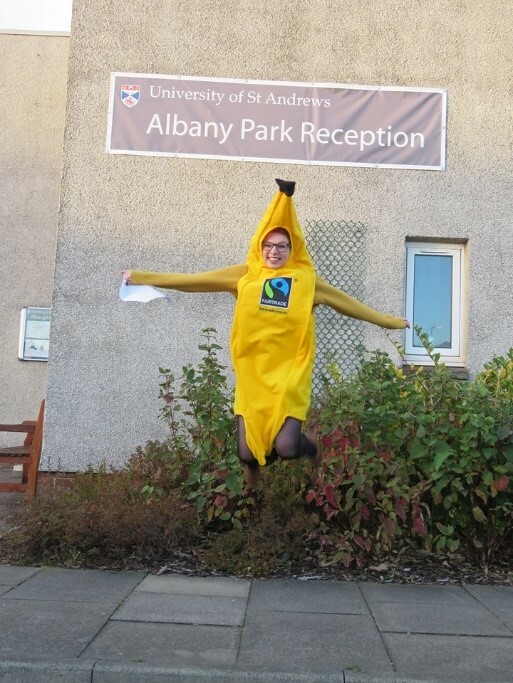 I’ve learned that the ridiculous seems to work better when it comes to raising awareness, as shown by the Fairtrade banana costume that some of the hall reps donned to spread the news of St Andrews as a Fairtrade university. The smoothie bike also made an appearance in Albany for Fairtrade Fortnight, and events like pumpkin carving where people made some amazing food from the leftovers went down well. So, while in many respects the year has flown by and there’s still so much more I had wanted to achieve, I think the best thing about being a hall Environments rep has been seeing how many projects are already going on around the university and trying to get the hall involved in them in some way. I think hall reps are a great way in general to try and make environmental things easier and more fun, and I hope this can continue! 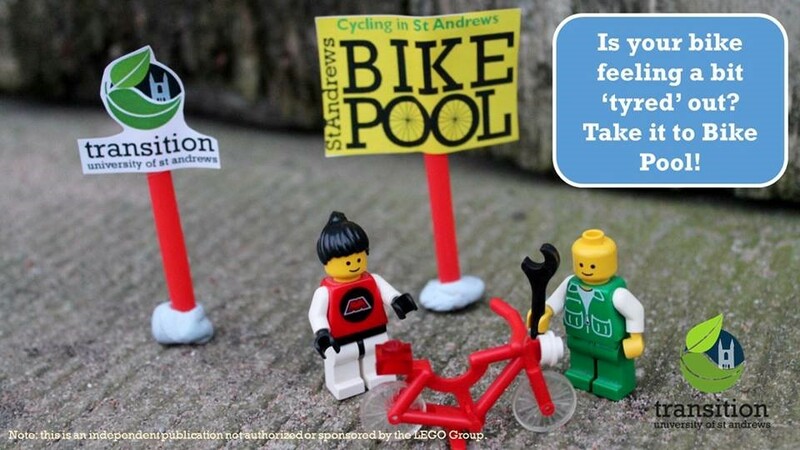 We are delighted to announce that St Andrews’ University Bike to Work Breakfasts are running on a monthly basis! Open to all staff members and post graduate students, Bike to Work Breakfasts are run and supported by Transition St Andrews, CAPOD and the Environment Team, plus our wonderful student volunteers. 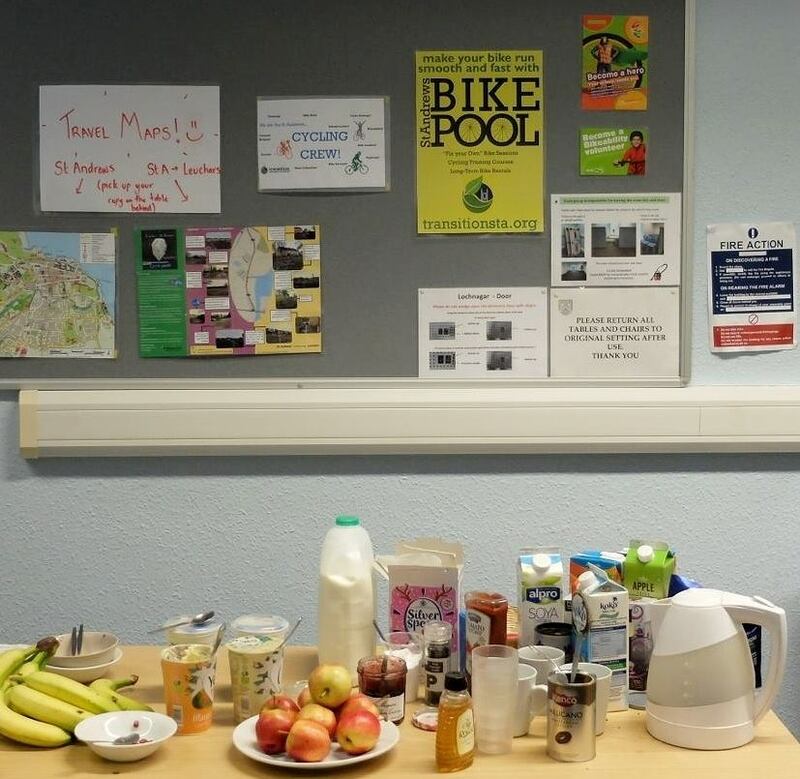 The main aims of the breakfasts are to encourage people to bike to work but also to build stronger relationships and connections between the cyclists that commute to work by bike within the university. We seek to do this to help the University of St Andrews reduce its overall carbon footprint as we strive towards a sustainable university. From the 2015 Staff Travel Survey 8% of staff members at the University of St Andrews cycle to work, but we believe more can cycle! Community provides the perfect opportunity for people to change behaviours and attitudes. 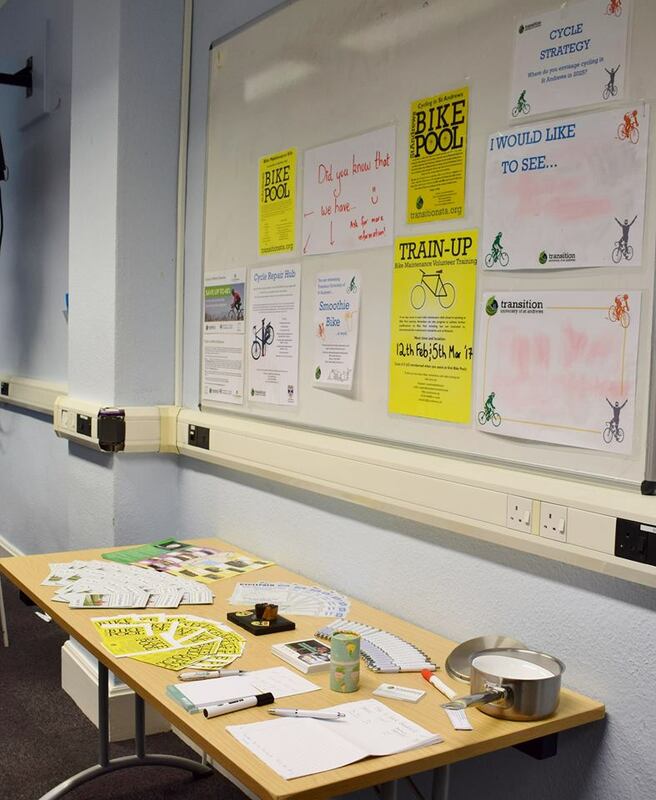 By putting on Bike to Work Breakfasts we hope to see more people regularly cycling to work, to continue to support and encourage those who already choose to bike to work, to strengthen the cycling community and to help decrease the university’s overall travel carbon footprint. Bike to Work Breakfasts don’t hold back when it comes to food. If you come along you’ll find yourself with a choice of hot and cold dishes ranging from delicious hot filled rolls to porridge, and from toast to multiple flavours of yoghurts (and sometimes pancakes)! We want to cater for everyone so if you have any dietary requirements or ideas of foods which we can make then please do get in touch! Good food and conversation often provides the perfect opportunity for new and creative ideas to form, and we have enjoyed hearing the encouraging feedback that has been given and the mini brain storming sessions that have occurred during these mornings. 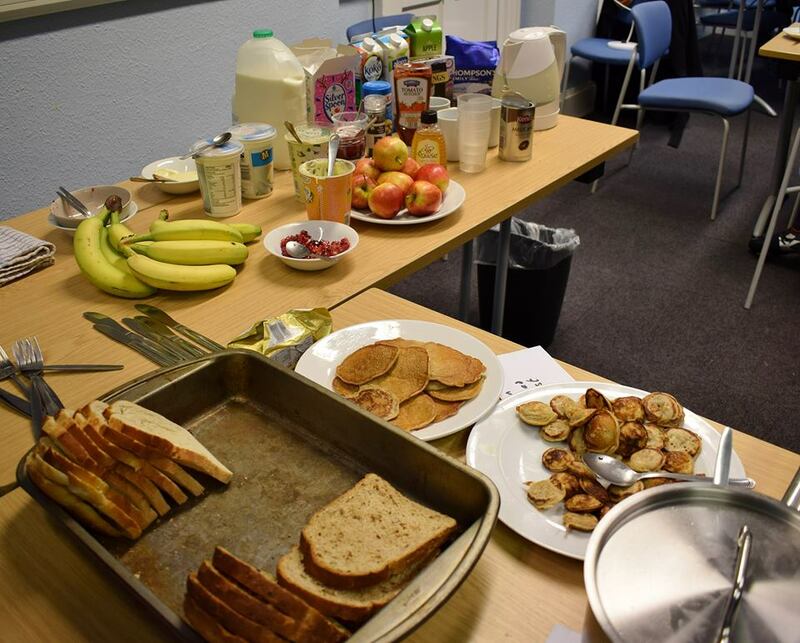 If you are a staff member of the University of St Andrews or a postgraduate student you are warmly welcome to join us for our next Bike to Work Breakfast next Wednesday (12th of April) from 8.00am – 9.00am at the Chaplaincy building (Mansefield building) on Market Street. We promise good food and conversation! If you want to find out more please email environment@st-andrews.ac.uk!